Shree Siddh Baba Keshav Nath Ji is the Guru of the Mohindru Bahri Biradari community. The Samadhi Sthal of the great Guru of the community is located at Jalandhar in Punjab. Shree Sidh Baba Keshav Nath Ji Mela 2020 date is February 4. The annual festival and fair attracts thousands of devotees. Mohindru Bahri Biradari community found it difficult to make living in the present day Sirsa region. The community relocated to the present day Jalandhar with the blessing of Shri Sidh Baba Keshav Nath Ji. Baba Ji built a small ashram here and advised the community. Through his advice and blessing the community prospered and finally settled in Jalandhar and flourished. Shri Sidh Baba Keshav Nath Ji performed intense penance for the welfare of the community in the present day Samadhi Sthal. 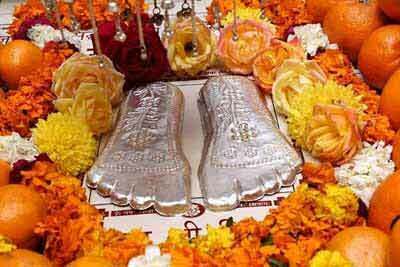 Charan Paduka – the holy footprints of Shri Sidh Baba Keshav Nath Ji – is worshipped here. Devotees find relief from sufferings after offering prayer in the holy spot. The mela and festival dedicated to the great saint is annually observed on Magh Shukla Paksha Dasami Tithi – tenth day during the waxing phase of moon in Magh month. Special pujas, rituals, charity and food donation is done of the day. The sacred place is decorated with flowers, leaves and lights. A major highlight is satsangs and bhajans. Another saint associated with the community is Param Sidh Shri Jiyo Sati Mata Ji. She was an ardent devotee of the Shri Sidh Baba Keshav Nath Ji. She guided the community and performed miracles. Her Samadhi too is located nearby in Jalandhar. There is a belief that all prayers offered to Shri Sidh Baba Keshav Nath Ji gets fulfilled after offering prayers at the Samadhi of Paramsidh Shri Jiyo Sati Mata Ji. Therefore all members of the community visit both the holy spot on Magh Sukla Paksha Dasami.